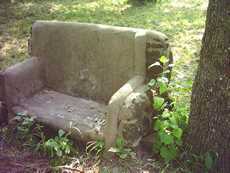 Limestone County Alfonso Steele Roadside Park, A Roadside Park Mystery in Texas. How did a house get built in a park donated to the State of Texas? In July of 2004 we received an interesting email from Rushin Steele, great-great-great-Grandson of Alfonso Steele, the Last Survivor of the Battle of San Jacinto. His letter is reprinted below. After the letter we have attached the solution to the mystery - as unearthed by Anne Cook, Librarian for TxDoT's photo library. I became troubled and a little heartbroken the other day by a site that pretty much sums up the entire misfortune of my family's name and history. My dad took me to a place that not many of my family know about. He wanted to show it to me before he passed so that I could show my children.......if it manages to survive that long. There have been many small write-ups on Alfonso Steele as being the last known survivor of the Battle at San Jacinto.......even though there has been some controversy that he wasn't. He wasn't if you count the two boys who didn�t participate in the fighting. These two were pulled out because of their youth. Even though they were teenagers, they appeared much younger. One stayed back to protect women and the other was a doctor's assistant. Since they weren't technically in the battle, many historians have overlooked them or didn't believe their stories. But they were still Texas Volunteers and that should count either way. Being the last to die of old age isn't the best claim to fame, but in later years these three men (like old men joking around a table) met at veteran�s meetings and argued about who would outlast who. Alfonso was also one of the first settlers in Limestone County and his wife (Mary Ann Powell) was direct kin to the Parkers of Fort Parker. Mary Ann�s mother's maiden name was Parker and she was a second or third cousin to Cynthia Ann Parker. For some reason the Steele's aren't listed with the other families on the Limestone County Courthouse memorial for being one of the first settlers in Limestone County. There is a Simms family listed [on the memorial] in huge writing, although there is no proof of a Simms in Limestone County until The 1860s. After years of fighting, only last year was the Steele name spelled correctly for a sign over the former �Steel� Creek. Alfonso's son, Alvarado Steele laid the first brick for construction of the Limestone County Courthouse and on that brick was a plaque with his name for his heroism during the Civil War. That brick was later removed and replaced with a plain brick...yet there was no damage to it and in fact it had even survived a fire that burned most of the courthouse. We were outside of Mexia, Texas, fairly close to Fort Parker on a road that had been part of the old original highway. My dad told me to turn into a particular driveway that went up to a brick house. As we were turning in, there were a set of old picnic tables and benches spread out in front and back of this person's yard. Most are now in pieces. We got out......with me arguing with him because there�s a big NO TRESSPASSING sign and I'm thinking we're going to be shot or have dogs unleashed on us. My Grandpa told the story a hundred times of it being the first Roadside Park and how he never rode in a new car but one time in his life and that first time was on the way to the ceremony for Alfonso in a 1930 Ford with his wealthy uncle. There was a story of this same uncle stealing the plaque that very next week on his way back to Dallas and a new plaque being put back six years later. That would move the the time line from 1930 to 1936, but there's no proof of this except for stories. My dad thinks my grandpa had his dates wrong and that the plaque was never stolen. I really don't care about stories unless there are facts to back them up. Regardless of it being dedicated to my great-great-great-Grandpa, it was like a slap in the face seeing the park in this condition. Why is there a house right in the middle of [the park]? I'm sad about it because there's probably nothing I can do to save it so my children can see it. I found your site by accident and read the story written by Mr. Bowman.....I thought it was ironic that he has both a story of The first State Roadside Park and a story of The Last Known Survivor of the San Jacinto Battle. I'm sure his stories are correct with plenty of proof, but I have noticed that history can be changed or forgotten totally within the blink of an eye. One lost, stolen or burned document or one number printed wrong by accident or intentionally. Or a story that you would like to believe so bad to be true because it hits so close to home. Only ghosts know history better than us and they're not talking. There is one other thing that Alfonso was known for by friends and family - it took him almost two years to recover from the near-fatal bullet wound to the stomach during the battle. During that time he learned to play the fiddle. There are four roadside parks currently part of the Texas highway system in Limestone County. The park in question, dedicated to Alfonso Steele is no longer maintained by the state. I talked to LaVonza Barkouskie with Limestone County maintenance TxDOT. 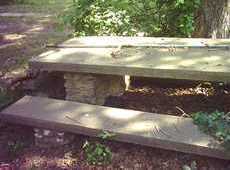 She described the location of this park as being on old state highway 14. 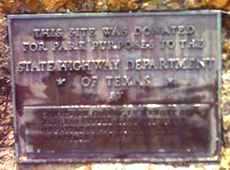 The Texas Highway Department (now TxDOT) sold that property to W.B. Moore. The deed transfer was recorded March 6, 1964. Since so many Texas counties are searching for historic ties, here is an opportunity for Limestone County to acquire one for practically nothing. No building to restore, no road to build and there is already a marker in place (although it might need a good cleaning). Even though the property is now in private hands, the expenditure of county funds to reclaim this roadside park would seem to be in everyone's interest.